Should eye exams for older adults be mandatory? Many medical experts might answer “yes” to this question. 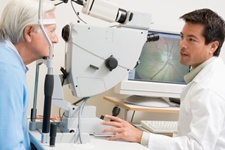 Left to their own devices, a lot of patients skip their biyearly, or even yearly, eye exam. As long as they can see, what’s there to worry about? According to a recent study performed in Singapore, a lot of things may be happening with your eyesight that you’re unaware of. The researchers looked at factors that contributed to a lack of awareness when it came to vision health in the general population and found some interesting results. The study included 1,504 adults and covered a whole range of eye conditions: cataracts, myopia, diabetic retinopathy, age-related macular degeneration, and glaucoma. In an unusual twist, the researchers took note of all who didn’t answer “yes” to having an eye condition, despite being previously told by their doctor that they did. The numbers were astounding: 83% were unaware of at least one of their eye conditions. After controlling for various factors, the researchers discovered that those most likely to be in-the-dark about their eye health were: older adults, those with better visual acuity, lower education, lower income, higher blood glucose, and/or higher serum cholesterol, and people who were less likely to wear glasses. So what seems to be happening here? If you can see with what you feel is normal acuity, you might decide that you don’t need an eye exam or convince yourself that any existing eye condition is not worth worrying about. Conversely, if you have high cholesterol or high blood glucose, you might not want to take in the fact that your eyes are also struggling. RECOMMENDED: Some vision health advice on how to get two superstar nutrients into your daily diet. Whatever the reasons, take an eye diagnosis seriously. Get regular checkups. Being aware of your eye condition can empower you to take better care of your eyes and prevent further problems in the years to come. Remember that your eyes are complex enough that they require a significant portion of your nutrient intake in order to function properly and remain healthy. If you aren’t eating nutritious foods, your eyes won’t be supplied with the vitamins, minerals and antioxidants they need. Huang, O.S. et al., “Lack of awareness of common eye conditions in the community,” Ophthalmic Epidemiol. 2013; 20(1): 52-60.